It was a late afternoon informal sending off ceremony which brought Ms. Elvira “Fairy” Clarke to tears on December 30th, 2013, as she thanked her past manager at the Vance W. Amory International Airport, management of the Nevis Air and Sea Ports Authority (NASPA) and her colleagues as she concluded 22 years of service as a cleaner at the Vance W. Amory International Airport. She was presented with a plaque inscribed “”Happy retirement Elvira Clarke – December 1992 to December 2013. Retirement is a time to look back with satisfaction; a time to look ahead with expectancy. May your future be filed with plentiful rewards you so greatly deserve from the Nevis Air and Sea Ports Authority” and gift by Board Chairman Mr. Collin Dore at the ceremony held above the Airport’s departure lounge which overlooks the runway. In response, a soft spoken and obviously overwhelmed Ms. Clarke could only muster a few words of appreciation. “Thank you all very much for coming to this great moment and I thank the Air and Sea Ports Authority who has me here on this pleasant day. I thank all of you,” she said. Meantime, a host of praise and advice were given to the retiree from General Manager of NASPA Mr. Oral Brandy, former Manager of the Airport Mr. Carlisle Powell and Mr. Dore. Mr. Brandy in his remarks thanked Ms. Clarke for her contribution to the Authority. “Let me thank Elvira for the significant contribution she would have made to NASPA over the many years she would have worked here. She would have done so for 13 years and prior to that she would have been working under the Nevis Island Administration, making it a total of 22 years altogether. “Working for 22 years for any entity must be a great accomplishment. As a matter of fact it is difficult to think of anyone who would have worked so long for any institution without leaving some positive impact on that institution. So there is no doubt that Elvira would have impacted NASPA in a very real and significant way with regard to NASPA’s growth and development,” he said. Mr. Brandy urged Ms. Clarke to see her retirement as a new chapter in her life and likened that time in one’s life to that of a tree. “It is definitely not the end of life but it’s a new chapter in her life. As a matter of fact, some see it as the time when one leaves the summer years of their life and go into autumn and so Elvira would have worked for the many years she can consider her summer years and now going into autumn she must see it as also another good time of her life because there is something special about autumn. “Autumn is a time when the trees shed their leaves and so Elvira can see it as a time when she would shed or get rid of some things and begin some new things and these trees obviously they shed their leaves to pave the way for new growth, new leaves and the same way she can find something very meaningful, something new, something that will bring joy and excitement to her life,” he said as he wished her well in her future endeavours. Mr. Powell, with whom she had served for the longest, in his remarks spoke to the quiet nature of Ms. Clarke and how she began her tenure at the Airport under his stewardship 13 years ago. “I don’t know if I ever had a more quiet worker in all the years I have worked any place that I have worked – extremely, extremely quiet…When I started at the Airport we had one cleaner and a watchman and one maintenance man and we grew from that to where we are now. Earlier on we made the approach to Elvira, I couldn’t understand why people of closer to the Airport were not working at the Airport so when we were looking for somebody to fill in for Ms. Annie I thought that Elvira living close by would be one of those ideal persons and I didn’t have one single regret for hiring her. “She didn’t give any trouble… and working with her was always very, very, very easy…I am here this afternoon because she was really an exceptional worker and our management team at the Airport in the early days â€“ [myself]] Steve and Brian, we took decisions as a team and I have never heard them complain too much about Elvira “Fairy” Clarke,” he said as he wished her a happy retirement. Mr. Dore who was the last to give remarks noted that 22 years of sustained employment at any institution was no mean feat and showed dedication and commitment. He was hopeful that those who came after Ms. Clarke would emulate her legacy at the Airport. The NASPA Board Chairman also told Ms. Clarke that her service to the Airport deserved recognition. Today we are here to celebrate with you Ms. Clarke. We want to show you in a meaningful way that we value your contribution over the years. I want to assure you, that the service you rendered to the Airport, even at the level of a cleaner, is something that we recognise as very important as it is the first impression that anyone visiting the Airport would get on arrival. “So you would have played your part. Don’t feel that you may not be sitting in an office upstairs when Mr. Powell was there and Mr. Hanley but even at your level you have done your part, you have made your mark on this institution,” he said. 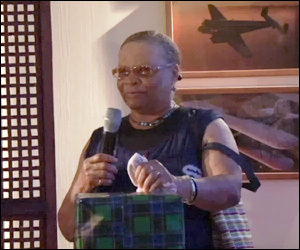 According to Mr. Dore, Ms. Clarke had been with the Airport at various stages of its development with the Ministry of Communications and later with the Authority but in spite of her retirement he told her she was welcome to return to the Airport as often as she pleased to mingle with former colleagues or to give advice in her area of expertise wherever it was needed. He also urged her to use her retirement to venture into new initiatives of benefit to her and to guide family and members of the community especially the youth on the right path. “We realise today our youths are straying and I believe that it gives you a chance even though not your grand children but the people of Newcastle you can socialise with them, instruct them properly and play a greater role in shaping the lives of your neighbours and your friends around you. “We want to wish you well and we want to thank you for the years of service and I am sure that NASPA did benefit from having you on staff over the years,” he said. The ceremony was chaired by Manager of the Vance W. Amory International Airport Mr. Stephen Hanley.